Hexagons are becoming more and more popular by the day! 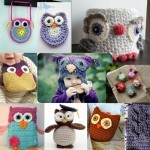 They’re not just a yarny trend, they’re a major theme in interior design too. There are several free hexagon motif patterns out there (future roundup anyone? 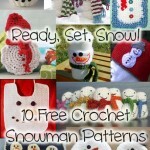 ), but the motif is just the starting point – it’s what you do with those pretty shapes that counts. 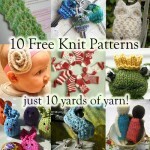 And as long as you make enough of them, in the “right” size for the pattern, the hexagons themselves are interchangeable! 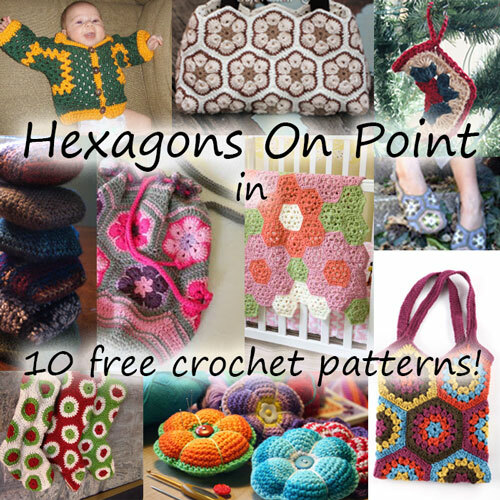 Here are some great free patterns for putting hexagons together in fabulous ways! African Flower Bag – This free pattern is available in both Swedish and English, and it uses the infamous African Flower Hexagon pattern to make a gorgeous round bag! 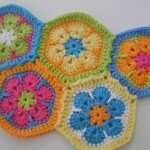 This pattern uses 12 hexagons and there is a great photo tutorial on how it’s all put together. Hexagon Market Bag – This bag is all hexagons! Ten hexagons, to be precise. 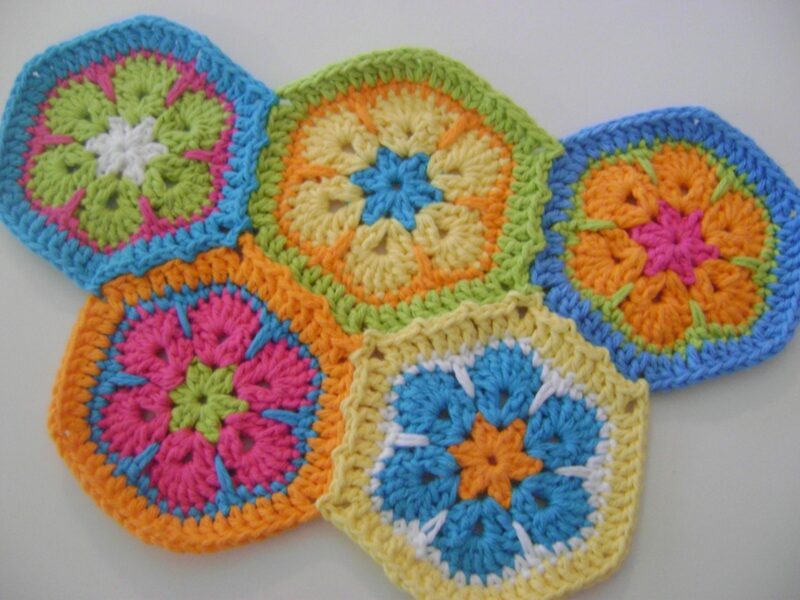 There’s a schematic drawing of how it all comes together, as well as directions for these great granny hexagons. 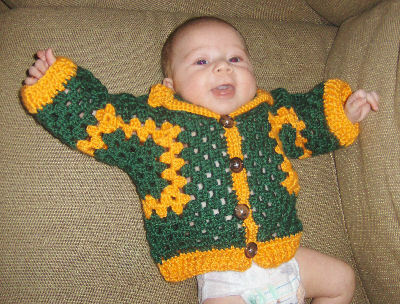 Hexagon Granny Baby Jacket – This clever pattern uses just 2 giant hexagons to make a baby jacket! I love this simplicity of this, and can’t imagine a faster way to make a baby sweater. You’d never guess at the construction just looking at the finished pattern! 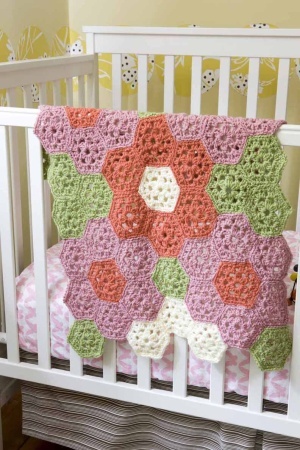 And with a bit of math this can be made in any size at all – just keep adding rows to get the hexagons to the needed size! Hexagon Slippers (archived) – This pattern is offered in both Russian and English, and like so many Russian patterns, it’s both simple and complex. Patient reading, a bit of math (to get just the right size) and the ability to read crochet charts come in handy here. And the end result is so pretty! Each slipper requires 9 hexagons and two pentagons. 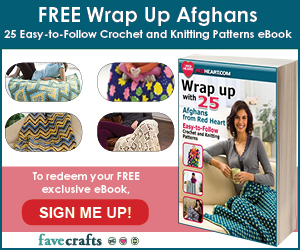 Garden Coverlet – This free Lion Brand pattern demonstrates a great way to arrange your hexagons. 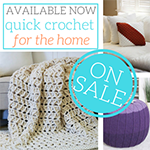 Making a blanket may be the obvious choice, but why just go random? These big bold flowers, from 53 hexagons, make a real statement! 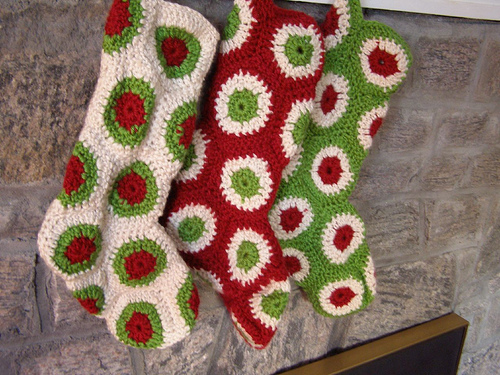 Polka Dot Christmas Stocking – This pattern is from Priscilla’s Crochet, but there’s a direct pdf link on Ravelry, so I’ve linked to that here, as it’s much easier to find. There are 17 hexagons in each stocking, but there’s no schematic, so you’ll need to take a close look at the pictures to figure out the assembly. 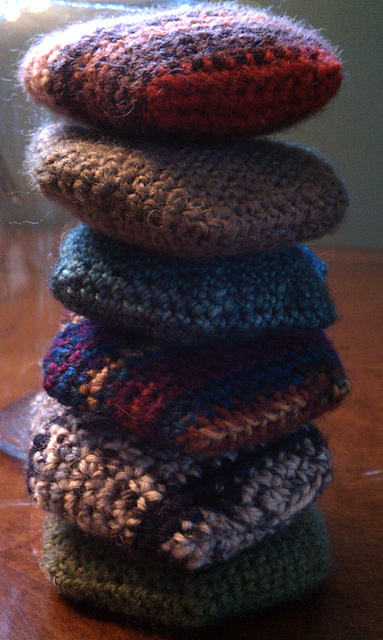 This picture from Ravelry user rynamite really shows off the pattern! 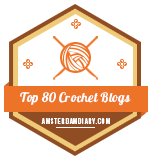 Crocheted Pin Cushion – I’ve linked to the English translation, but the original of this pattern was in Danish. 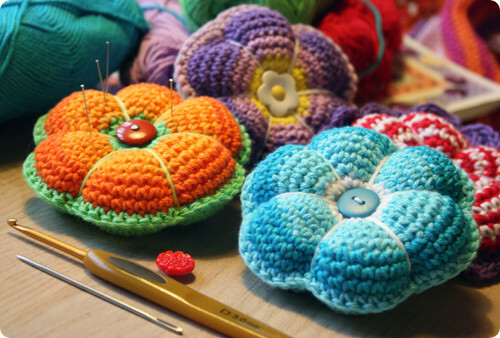 No matter which version you follow, it takes just two hexagons to make this pretty pin cushion! Mini Motif Stocking – This smart little pattern from the incomparable Doris Chan is a free Ravelry download. And it takes just one hexagon to make! 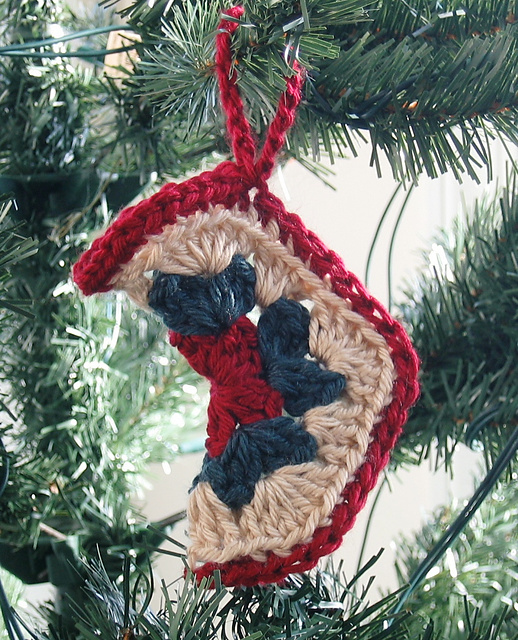 These are cute on the tree and as present toppers. Or as Doris suggests, fill them with candy and hand them out to your coworkers or kids’ classmates! Too fun! 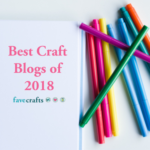 The Apiary Puff – Inspired by the super popular Beekeeper’s Quilt knitting pattern, and lucky for us crocheters, it’s a free Ravelry download! It’s got a very different construction method than the other hexagons here, but it’s too cool to not make the list. African Flower Crochet Purse – This one is so gorgeous I couldn’t resist! 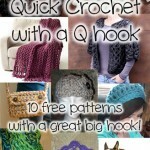 There is a really well done photo tutorial and written pattern here, including instructions for the lining and handles. There are 28 hexagons and 4 squares in this pattern, adding up to a lovely bag! Are you crazy about hexagons too? I love the endless possibilities – the ability to swap out almost any hexagon pattern with any scheme and create something totally new. Which hexagon pattern is your favorite? Share a link with us in the comments! Be sure to check out and like the moogly Facebook page to get the latest updates, links, sneak peeks, and more! Moogly is also on Pinterest, Twitter, and now Tumblr – come join the fun! 10 Yards or Less? 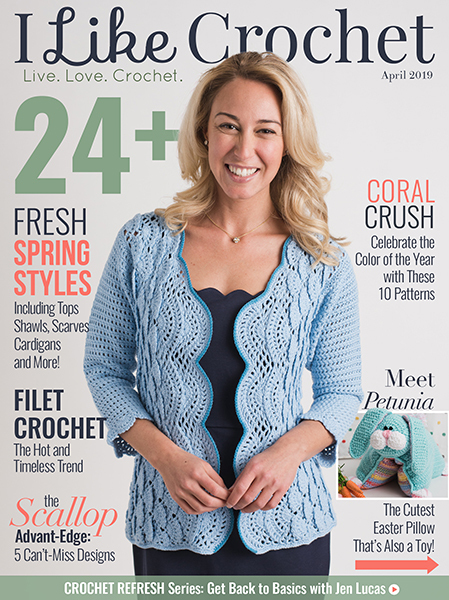 Knit It! I love your patterns, they are so exciting and easy to follow. I make most of them for the local hospital ( early babies) etc, but will have to sell some of my creations to continue as the cost of the yarn is ever increasing. Thank you so much for your patterns. Absolutely, I am thinking about hand writing little tie -on labels with instructions for washing etc., which will include a full address link to your website. 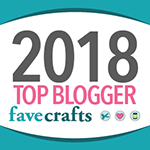 I am so grateful to people like yourself who willingly give their time and experience to help those of us who are learning the art of crochet. Thank you so very much.. I love the purses!! I need to add these to my to-do list! I have made Pricilla’s Polka Dot stockings.